The 105-foot-tall (38-meter-tall) "Christ the Redeemer" statue in Rio de Janeiro, Brazil, was among the "new seven wonders of the world" announced July 7 following a global poll to decide a new list of human-made marvels. The winners were voted for by Internet and phone, American Idol style. The other six new wonders are the Colosseum in Rome, India's Taj Mahal, the Great Wall of China, Jordan's ancient city of Petra, the Inca ruins of Machu Picchu in Peru, and the ancient Maya city of Chichén Itzá in Mexico. The contest was organized by the New7Wonders Foundation—the brainchild of Swiss filmmaker and museum curator Bernard Weber—in order to "protect humankind's heritage across the globe." The foundation says the poll attracted almost a hundred million votes. Yet the competition has proved controversial, drawing criticism from the United Nations' cultural organization UNESCO, which administers the World Heritage sites program. "This initiative cannot, in any significant and sustainable manner, contribute to the preservation of sites elected by [the] public," UNESCO said in a statement. This newly elected world wonder was built along China's northern border over many centuries to keep out invading Mongol tribes. Constructed between the fifth century B.C. 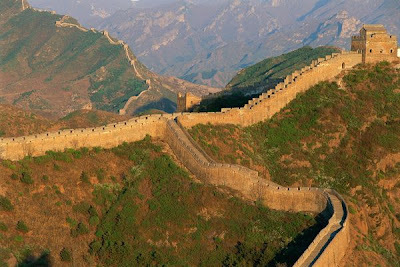 and the 16th century, the Great Wall is the world's longest human-made structure, stretching some 4,000 miles (6,400 kilometers). The best known section was built around 200 B.C. by the first emperor of China, Qin Shi Huang Di. The wall was among the winners of the New7Wonders poll announced during a televised ceremony in Lisbon, Portugal. However the Chinese state broadcaster chose not to broadcast the event, and Chinese state heritage officials refused to endorse the competition. It was a different story for some of the other candidates. 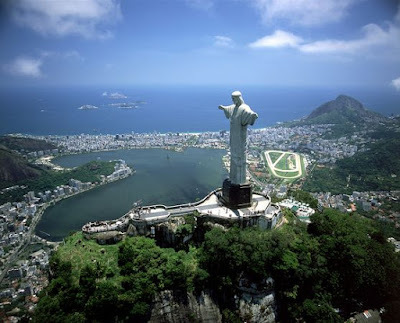 In Brazil, for example, President Luiz Inácio Lula da Silva encouraged his compatriots to vote for Rio de Janeiro's mountaintop statue of Jesus Christ. 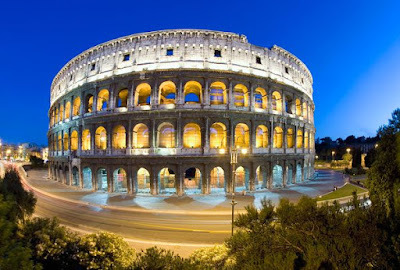 The only finalist from Europe to make it into the top seven—the Colosseum in Rome, Italy—once held up to 50,000 spectators who came to watch gory games involving gladiators, wild animals, and prisoners. Construction began around A.D. 70 under Emperor Vespasian. Modern sports stadiums still resemble the Colosseum's famous design. European sites that didn't make the cut include Stonehenge in the United Kingdom, the Acropolis in Athens, Greece, and the Eiffel Tower in Paris, France. The Vatican in Rome accused the competition's organizers of ignoring Christian monuments, none of which was featured among the 20 finalists. Archbishop Mauro Piacenza, head of culture and archaeology at the Vatican, called the omission of sites such as the Sistine Chapel "inexplicable." Perched on the edge of the Arabian Desert, Petra was the capital of the Nabataean kingdom of King Aretas IV (9 B.C. to A.D. 40). Petra is famous for its many stone structures such as a 138-foot-tall (42-meter-tall) temple carved with classical facades into rose-colored rock. The ancient city also included tunnels, water chambers, and an amphitheater, which held 4,000 people. The desert site wasn't known to the West until Swiss explorer Johann Ludwig Burckhardt came across it in 1812. Jordan has taken the New7Wonders competition seriously. 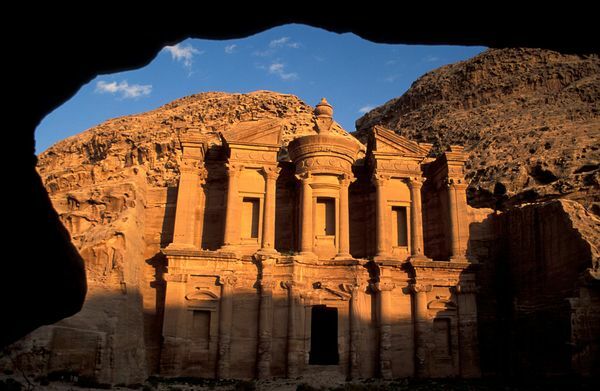 Petra is an important attraction in a country where tourism has recently suffered due to troubles in the Middle East region, particularly in neighboring Iraq. The Jordanian royal family backed a campaign promoting Petra's selection. 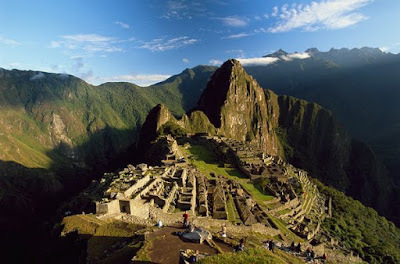 One of three successful candidates from Latin America, Machu Picchu is a 15th-century mountain settlement in the Amazon region of Peru. The ruined city is among the best known remnants of the Inca civilization, which flourished in the Andes region of western South America. The city is thought to have been abandoned following an outbreak of deadly smallpox, a disease introduced in the 1500s by invading Spanish forces. Hundreds of people gathered at the remote, 7,970-foot-high (2,430-meter-high) site on Saturday to celebrate Machu Picchu's new "seven wonders" status. The winners were revealed at a soccer stadium in the Portuguese capital, Lisbon, where Machu Picchu reportedly got one of the biggest cheers. The other two Latin American selections were Christ the Redeemer in Rio de Janeiro, Brazil and Chichén Itzá, Mexico. Chichén Itzá is possibly the most famous temple city of the Mayas, a pre-Columbian civilization that lived in present day Central America. It was the political and religious center of Maya civilization during the period from A.D. 750 to 1200. 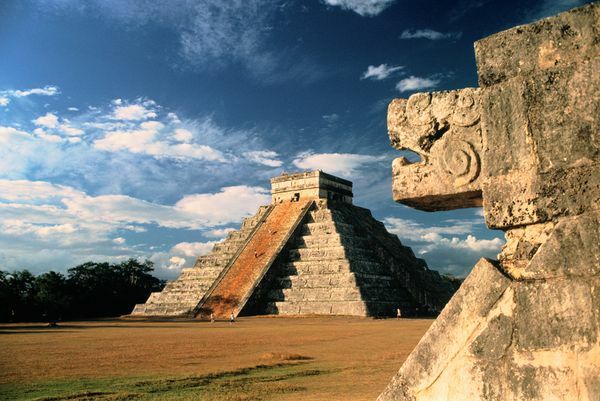 At the city's heart lies the Temple of Kukulkan (pictured)—which rises to a height of 79 feet (24 meters). Each of its four sides has 91 steps—one step for each day of the year, with the 365th day represented by the platform on the top. The New7Wonders competition was launched in 1999, and the voting process beginning in 2005. Nearly 200 nominations that came in from around the world were narrowed down to 21. Unsuccessful finalists included the giant statues of Easter Island in the Pacific Ocean; the Kremlin in Moscow, Russia; and the Sydney Opera House in Australia. 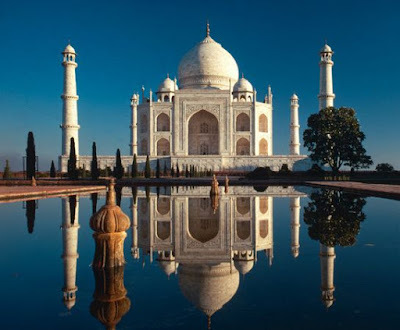 The Taj Mahal, in Agra, India, is the spectacular mausoleum built by Muslim Mughal Emperor Shah Jahan to honor the memory of his beloved late wife, Mumtaz Mahal. Construction began in 1632 and took about 15 years to complete. The opulent, domed mausoleum, which stands in formal walled gardens, is generally regarded as finest example of Mughal art and architecture. It includes four minarets, each more than 13 stories tall. Shah Jahan was deposed and put under house arrest by one of his sons soon after the Taj Mahal's completion. It's said that he spent the rest of his days gazing at the Taj Mahal from a window. The Egyptian pharaoh Khufu built the Great Pyramid in about 2560 B.C. to serve as his tomb. The pyramid is the oldest structure on the original list of the seven wonders of the ancient world, which was compiled by Greek scholars about 2,200 years ago. It is also the only remaining survivor from the original list. The Great Pyramid is the largest of three Pyramids at Giza, bordering modern-day Cairo. Although weathering has caused the structure to stand a few feet shorter today, the pyramid was about 480 feet (145 meters) high when it was first built. It is thought to have been the planet's tallest human-made structure for more than four millennia. 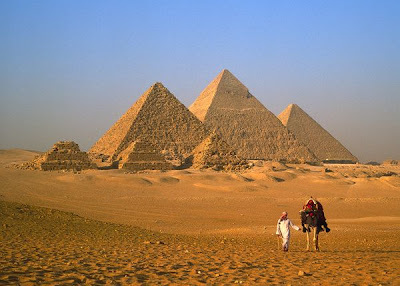 Initially the Giza Pyramids were top contenders in the Internet and phone ballot to make a new list of world wonders. But leading Egyptian officials were outraged by the contest, saying the pyramids shouldn't be put to a vote. "This contest will not detract from the value of the Pyramids, which is the only real wonder of the world," Egypt's antiquities chief Zahi Hawass told the AFP news agency. Instead competition organizers withdrew the Pyramids from the competition in April and granted them "honorary wonder" status. 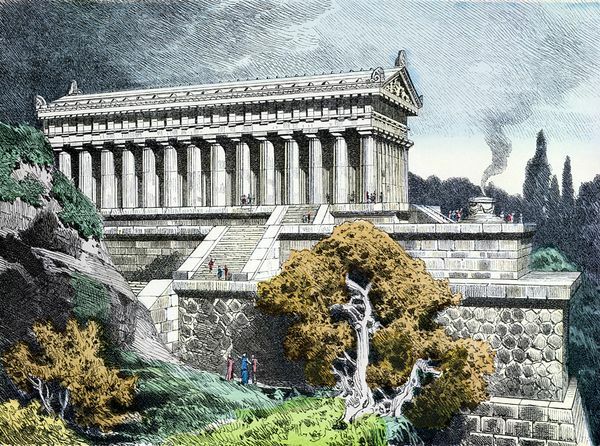 In contrast to the pyramids, the colossus was the shortest lived of the seven wonders of the ancient world. Completed in 282 B.C. after taking 12 years to build, the Colossus of Rhodes was felled by an earthquake that snapped the statue off at the knees a mere 56 years later. 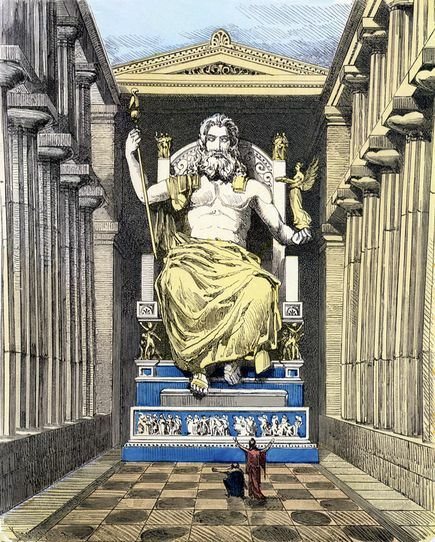 The towering figure—made of stone and iron with an outer skin of bronze—represented the Greek sun god Helios, the island's patron god. It looked out from Mandráki Harbor on the Mediterranean island of Ródos (Rhodes), although it is no longer believed to have straddled the harbor entrance as often shown in illustrations. The Colossus stood about 110 feet (33 meters) tall, making it the tallest known statue of the ancient world. It was erected to celebrate the unification of the island's three city-states, which successfully resisted a long siege by the Antigonids of Macedonia. 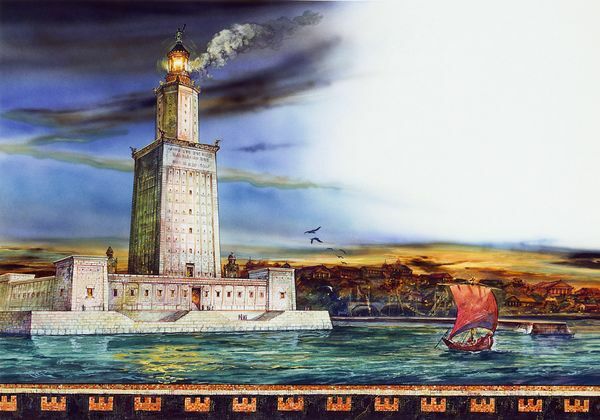 The lighthouse was the only ancient wonder that had a practical use, serving as a beacon for ships in the dangerous waters off the Egyptian port city of Alexandria, now called El Iskandarîya. Constructed on the small island of Pharos between 285 and 247 B.C., the building was the world's tallest for many centuries. Its estimated height was 384 feet (117 meters)—equivalent to a modern 40-story building—though some people believe it was significantly taller. The lighthouse was operated using fire at night and polished bronze mirrors that reflected the sun during the day. It's said the light could be seen for more than 35 miles (50 kilometers) out to sea. The huge structure towered over the Mediterranean coast for more than 1,500 years before being seriously damaged by earthquakes in A.D. 1303 and 1323. 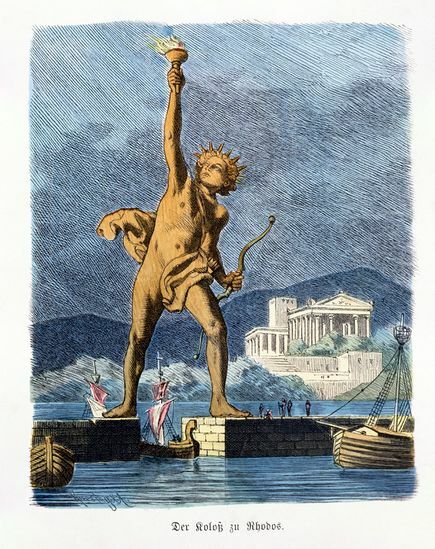 The massive gold statue of the king of the Greek gods was built in honor of the original Olympic games, which began in the ancient city of Olympia. The statue, completed by the classical sculptor Phidias around 432 B.C., sat on a jewel-encrusted wooden throne inside a temple overlooking the city. The 40-foot-tall (12-meter-tall) figure held a scepter in one hand and a small statue of the goddess of victory, Nike, in the other—both made from ivory and precious metals. The temple was closed when the Olympics were banned as a pagan practice in A.D. 391, after Christianity became the official religion of the Roman Empire. The statue was eventually destroyed, although historians debate whether it perished with the temple or was moved to Constantinople (now Istanbul) in Turkey and burned in a fire. The hanging gardens are said to have stood on the banks of the Euphrates River in modern-day Iraq, although there's some doubt as to whether they ever really existed. 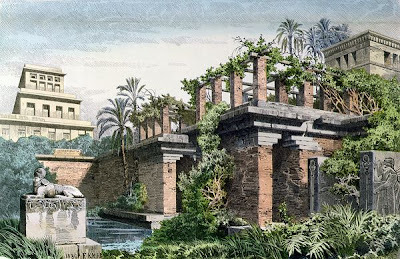 The Babylonian king Nebuchadnezzar II supposedly created the terraced gardens around 600 B.C. at his royal palace in the Mesopotamian desert. It is said the gardens were made to please the king's wife, who missed the lush greenery of her homeland in the Medes, in what is now northern Iran. Archaeologists have yet to agree on the likely site of the hanging gardens, but findings in the region that could be its remains include the foundations of a palace and a nearby vaulted building with an irrigation well. The most detailed descriptions of the gardens come from Greek historians. There is no mention of them in ancient Babylonian records. 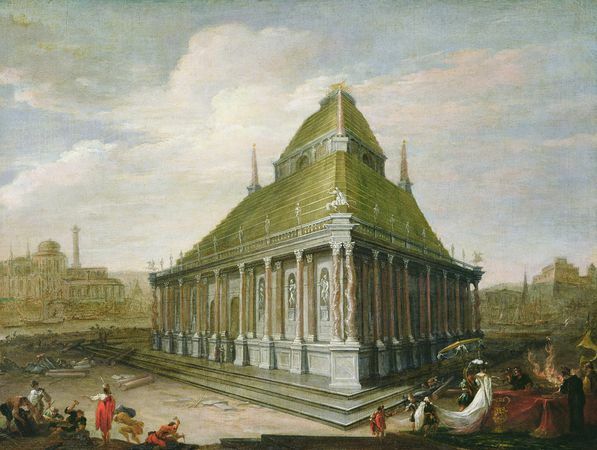 The famous tomb at Halicarnassus—now the city of Bodrum—was built between 370 and 350 B.C. for King Mausolus of Caria, a region in the southwest of modern Turkey. Legend says that the king's grieving wife Artemisia II had the tomb constructed as a memorial to their love. Mausolus was a satrap, or governor, in the Persian Empire, and his fabled tomb is the source of the word "mausoleum." The structure measured 120 feet (40 meters) long and 140 feet (45 meters) tall. The tomb was most admired for its architectural beauty and splendor. The central burial chamber was decorated in gold, while the exterior was adorned with ornate stone friezes and sculptures created by four Greek artists. The mausoleum stood intact until the early 15th century, when Christian Crusaders dismantled it for building material for a new castle. Some of the sculptures and frieze sections survived and can be seen today at the British Museum in London, England. 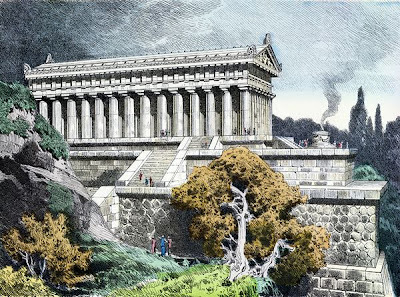 The great marble temple dedicated to the Greek goddess Artemis was completed around 550 B.C. at Ephesus, near the modern-day town of Selçuk in Turkey. In addition to its 120 columns, each standing 60 feet (20 meters) high, the temple was said to have held many exquisite artworks, including bronze statues of the Amazons, a mythical race of female warriors. A man named Herostratus reportedly burned down the temple in 356 B.C. in an attempt to immortalize his name. After being restored, the temple was destroyed by the Goths in A.D. 262 and again by the Christians in A.D. 401 on the orders of Saint John Chrysostom, then archbishop of Constantinople (Istanbul). Today the temple's foundations have been excavated and some of its columns re-erected. I don't think some of these wonders (Like the Pyramids)should be put in to comparison with others. It undermines their greatness!! !